Many Economists are making dire predictions about the next economic slowdown due to the increases in world leverage since the 2008 crash. Bill Mauldin is the latest to publish an interesting commentary on this. The main thesis of his post is he sees far more dangers than the Federal Reserve. 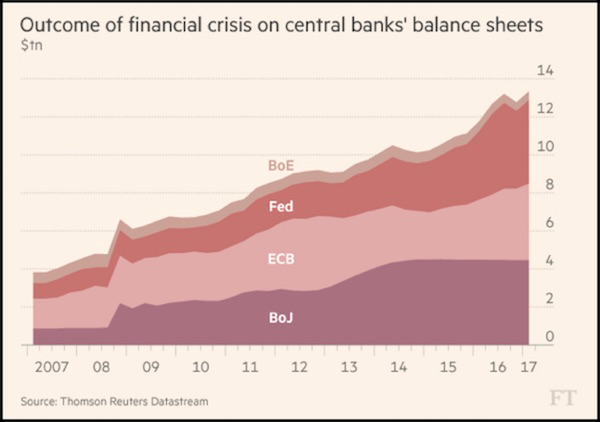 Would I say there will never, ever be another financial crisis? You know probably that would be going too far, but I do think we’re much safer, and I hope that it will not be in our lifetimes and I don’t believe it will be. So who is right: Was 2008 a once in a lifetime economic experience, or is there another disaster looming? As is true in most cases, hopefully the answer is somewhere in the middle. But the leverage is something to think about. In 2007, the GDP of the G7 countries (which is a decent approximation of the above chart) was 31 trillion. In 2017, it is estimated to be 36 trillion. In 10 years, the G7 economic output as increased just over 16%, yet leverage is now more than tripled. So for an analogy, lets say in 2007 you were earning $31,000/year, and had outstanding debts of $4,000. In 2017, you think you will be earning $36,000/year with debts of $13,000. Would you consider yourself fiscally better off in 2007 or 2017? How worried would you be if there was a recession on the horizon. Some economists may question whether this is a valid analogy or not, but it does show the magnitude of how the countries fiscal health has changed. Obviously Janet Yellen doesn’t consider that analogy totally on target, based on her above quote. I would sure like to see better evidence as to why she thinks we are so much better off now. Generals always fight the last war. The next crisis probably won’t originate in residential mortgage loans. It will come from somewhere else, and we have no idea whether the banks are actually ready for it. I don’t get the impression this worldwide glut of debt greatly concerns the Federal Reserve Board. Hopefully they are right. If they are wrong, history will likely place the blame for any major economic downturn squarely on the Federal Reserve and all worldwide central banks.